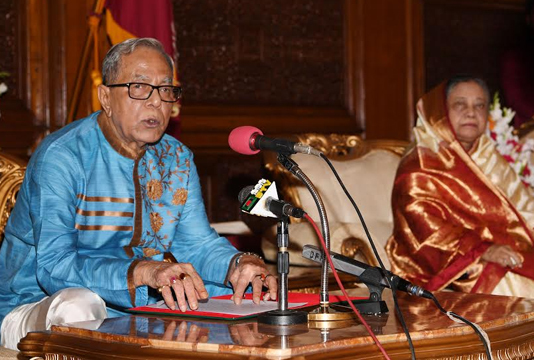 President M Abdul Hamid on Friday urged all irrespective of religions and castes to prevent anti-liberation evil forces to continue the pace of development in the country. “The anti-liberation forces have repeatedly tried to prevent the country’s democratic progress and development . . . But the country is moving forward,” he said while hosting a reception for Hindu community at Bangabhaban in the capital on Durga Puja, the biggest religious festival of Bangalee Hindu community. Noting that humanity is an eternal message of religion, President Hamid called upon all to abide by the rules of religion and simultaneously come forward for welfare of human beings. President Hamid and his spouse Rashida Khanom exchanged greetings with the guests during the reception at the presidential palace.